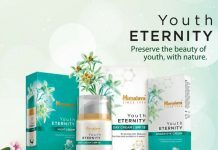 Biotique skincare brand has recently launched a range of DIY facial kits in 6 different variants. These 4-step facial kits are easy to use at home and are quite affordable too. 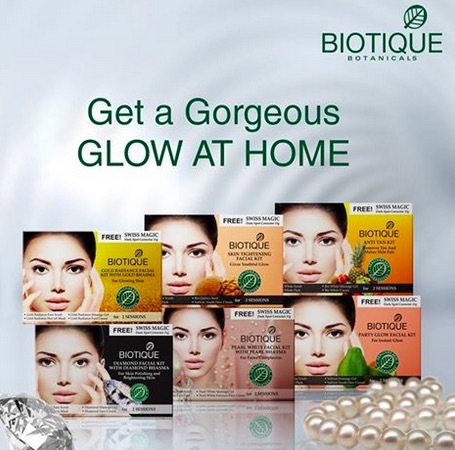 You can buy these facial kits from Biotique’s official website biotique.com. Given below is the list of the Biotique facial kits available in India. 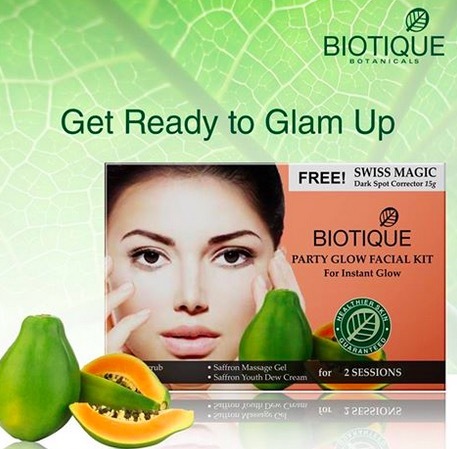 Biotique Bio Party Glow Facial Kit Price – Rs.215 for 75g : Party Glow Facial Kit is enriched with natural ingredients like saffron, papaya, clove, etc. 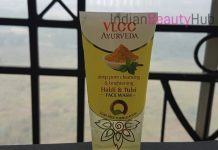 It claims to give instant glow to your dull skin and is suitable for 2 usages. The facial kit includes Papaya scrub, Saffron massage gel, Clove pack and Saffron Youth Dew cream. 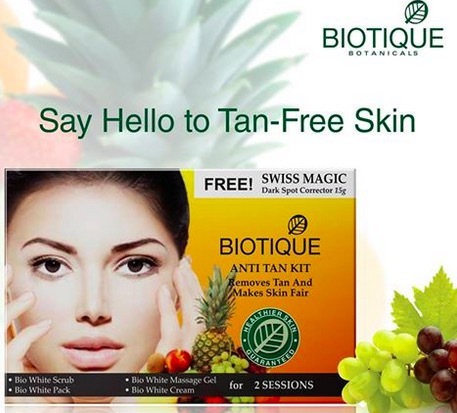 Biotique Bio Anti Tan Facial Kit Price – Rs.215 for 75g : It claims to removes tan and makes skin fair. This kit consists 4 steps and is suitable for 2 sessions. Kit includes Bio White scrub, Bio White massage gel, Bio White pack and Bio White cream (15 g each). 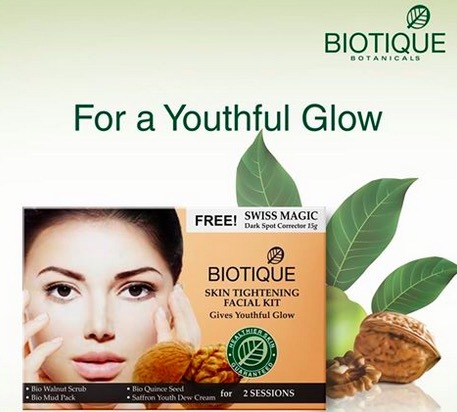 Biotique Bio Skin Tightening Facial Kit Price – Rs.215 for 75g : This kit includes 4 products and it claims to give youthful glow to face. 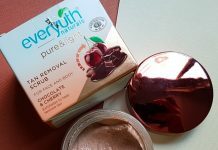 This kit contains Bio Walnut scrub, Bio Quince seed, Bio Mud pack, Saffron Youth Dew cream. 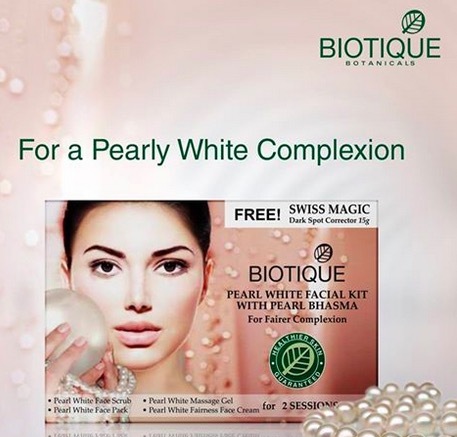 Biotique Bio Pearl White Facial Kit Price – Rs.235 for 75g : Formulated with Pearl Bhasma and helps to get fairer complexion. This kits contains – Pearl White face scrub, Pearl White massage gel, Pearl White face pack, Pear White Fairness face cream (15g each). 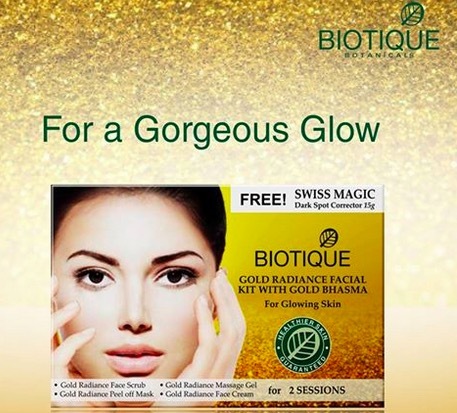 Biotique Bio Gold Radiance Facial Kit Price – Rs.235 for 75g : It is enriched with Gold Bhasma and helps promote glowing skin. This kit contains Gold Radiance face scrub, Gold Radiance massage gel, Gold Radiance peel off mask and Gold Radiance face cream (15g each). 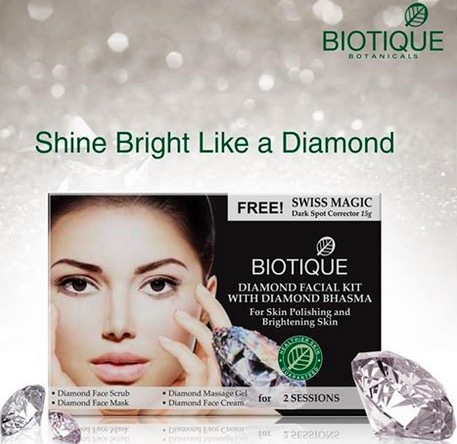 Biotique Bio Diamond Facial Kit Price – Rs.330 for 75g : This facial Kit is enriched with Diamond Bhasma and helps in skin polishing and brightening skin. The kit includes – Diamond face scrub, Diamond massage gel, Diamond face mask, Diamond face cream (15g each).